Emergency Evacuation Diagrams are designed to show building occupants and visitors with a clear direction of travel when they need to choose an appropriate escape route when trying to exit a building. Emergency Evacuation Diagrams for your workplace are compulsory under Australian Standard 3745 in all states/territories of Australia. It is an important element of your facility’s safety plan. A compliant evacuation diagram is to contain the layout of the buildings, assembly point, exits, location of firefighting equipment, fire indicator panel, fire stairs, escape routes, etc. as well as optional elements such as site plan, emergency information, spill kits, etc. 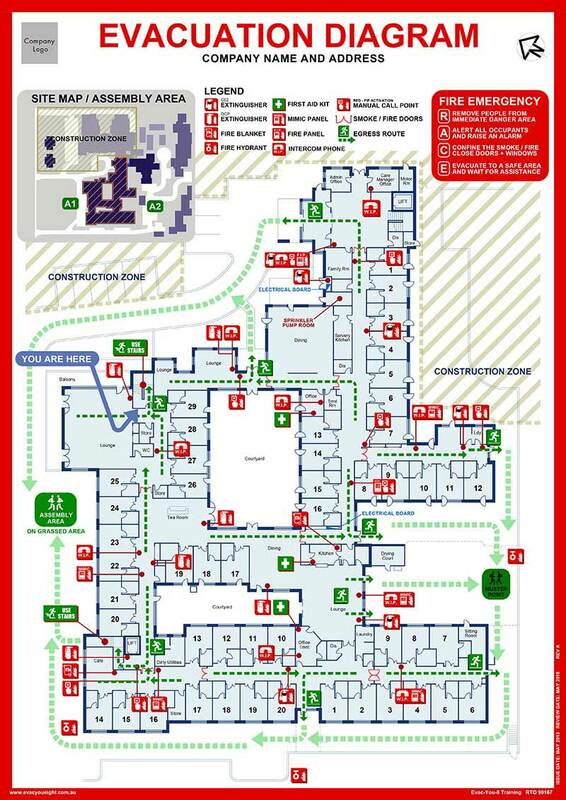 All maps are oriented with a “You are here” sign to ensure ease of use and basic procedures to enable a fast evacuation. Our experienced consultants will visit your workplace and a walk around at the site will then be completed in order to customise the evacuation diagram to show all regulatory requirements. Our consultant will advise as to the minimum elements required and assist in selecting the appropriate optional elements that will allow satisfactory understanding of the diagrams. Australian Standard 3745-2010 Emergency Control Organisation and Procedures for buildings, structures and workplaces. All of our diagrams are produced according to the relevant state/territory OH&S Legislation and mark-ups are completed on-site at your location to ensure accuracy. Before any diagrams are completed, our consultants will visit your workplace to decide upon appropriate evacuation assembly points and/or meeting places. A walk around at the site will then be completed. All evacuation diagrams are emailed to our clients in advance for pre-approval for any changes before printing. It is normally produced in A3 colour and are laminated to ensure durability. Our Evacuation Diagrams includes your company logo and will be delivered to the facility, either by post or by the consultant. Email: contact@evacyoueight.com.au or call 1300 738 133 to get a quote for your workplace today.